The AFL (Australian Football League) is one of the most popular sports in Australia, and first began in the late 1800s. Initially made up from Victorian teams, the league soon grew to accommodate teams from other states, and now (in 2017) consists of 18 teams from most Australian states. With supporters all over the country, it is one of the most watched football codes on Australian television, and is one of the most popular club-based participation sports for adults and children. But until recently, this was only the case for males. While girls have always been encouraged to participate in the sport, many have had to stop playing at the age of thirteen or fourteen because the sport was considered too rough for mixed teams. With few female-based leagues around, girls in the past have had to give up their dreams of an AFL career. But all that is changing, albeit very slowly. While the first recorded match between women dates back to 1917, and the 1980s saw the Victorian Women’s Football League (VWFL) formed, there has been no national competition for women until 2017, when the AFL (finally) launched the NAB AFL Women’s Competition. With eight teams competing, made up of talented female footballers and other athletes who have made the switch to AFL, the games were extremely well received and have created new pathways for women in the sport. Daisy Pearce (Melbourne), Emma King (Collingwood), Katie Brennan (Western Bulldogs), Darcy Vescio (Carlton), Maddy Collier (Greater Western Sydney), Kara Donnellan (Fremantle), Sabrina Frederick-Traub (Brisbane) and Erin Phillips (Adelaide). Featuring fun facts and information about the players, it also lists their greatest talents, their inspirations, and role models. This book reveals how they got to elite level, and highlights their love for the game. 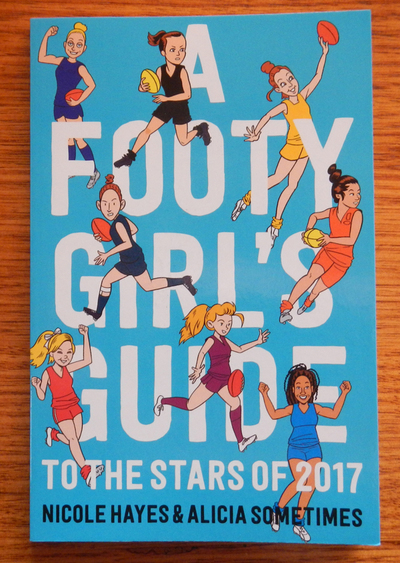 Essential reading for any young girl who is passionate about playing in the AFLW in the future, this book will provide all the motivation needed to make their dreams come true.